Exterior painting - MrFix finds you an experienced painter within 3 hours. Exterior painting - MrFix finds you an experienced painter within 3 hours. Need exterior painting? Home improvement service MrFix! How do I request exterior painting? There are two columns in my house, approx. 1m in dimension each side. I have picked up a sufficient amount of wallpaper, and will need someone to hang the wallpaper. Zie bijgaand bouwtechnisch rapport. Geef graag duidelijk aan welke punten voor rekening vd VvE komen en welke voor rekening vd bewoners. Klant vraagt offerte voor VvE maar we kunnen bewoners ook offerte of prijsindicatie geven. All MrFix rates are fair and transparent. MrFix has negotiated fixed rates with our partner painters: €50 per hour including VAT (9% only) and call-out charge for jobs that take less than a day. For jobs that take more than one day we recommend that you request a quote (fixed price), not only for maximum certainty but also because most painters offer a discount (often 10-20%) for bigger jobs. If you give sufficient information (e.g. via the WhatsApp group that MrFix creates for you) you may get an estimate or even a quote without the usual inspection visit: that would save you time and money. Now you may not need a painter again for several years, but the painter works with MrFix regularly. That means he will quote you a competitive price and do the job in the best possible way! Did you know that the Dutch tax authority helps keep exterior painting affordable by applying the reduced VAT rate of 9% (instead of 21%)? See the rules, unfortunately in Dutch only. The paint jobs that MrFix arranges are often substantial, so your tax saving is substantial too! Please note: the low VAT rate only applies to homes older than 2 years and applies to both labour and materials. The Dutch weather gives you a lot of rain during winter but fortunately also a lot of sunshine in summer. But both types of weather are no good for the paint on the outside of your house. 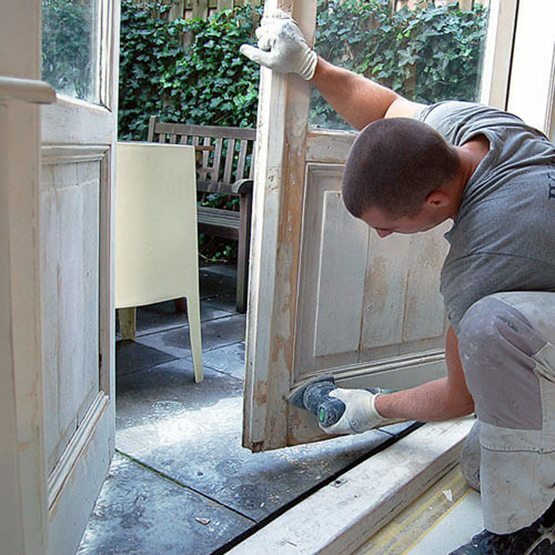 Regular painting is needed to protect the wood from decaying. When you wait too long costs of repair can be high. For proper maintenance the exterior woodwork of your house should be painted every 5 years. Do you want a new look of the exterior of your house? The wide range of colours make it hard to choose the best, and a mistake can cost a lot of money and time to correct. Quality exterior paint jobs that last for many, many years require professionalism and experience. Our specialist chooses the painting method and kinds of paint that fit the surface type and usage best. It’s simple: fill out the web form and we will match your job with the right expert within three hours. Easy, right? MrFix has a painter available even today. Make your “DETAILED DESCRIPTION OF JOB” as precise as possible: please specify colours, measures, obstructions or other limitations. For further questions about exterior painting rates see the Rates page or call us on 020-675 0333 (Mon-Sat 8.30-18h). The work of our qualified exterior painters is covered by a triple guarantee: 1) the guarantee by the painter himself. 2) his liability insurance and 3) MrFix’s leverage over the expert. So you are in safe hands. For urgent jobs you can contact MrFix. We will connect you to the right painter for your urgent exterior painting job within 3 hours, and often faster than that. Please note: there is a 50% surcharge for jobs that must start within 24 hours, after 18h, on weekends or on holidays. Some jobs simply cannot be done during normal working hours. That is why MrFix has an exterior painter ready for special request 24 hours a day, also on weekends. Our qualified exterior painters are ready to do every conceivable paint job in the West and Centre of The Netherlands quickly. We serve the whole western conurbation (the Amsterdam, Haarlem, The Hague, Rotterdam, Utrecht area) but also the surrounding parts of Holland, up to and including Eindhoven and Apeldoorn. The quickest way to request exterior painting is via our web form and if you prefer you can also mail, call 020-6750333 (Mon-Sat 8.30-18h) or send a WhatsApp message to 06-15380087. Painting serves not only to make your house prettier but also to protect it from the wet, variable Dutch weather. In autumn and winter your exterior walls and window frames in particular are under attack from rain and frost. In spring and summer they face sunshine and high temperatures. High quality paint and professional paintwork are essential for avoiding any exposed paint peeling, wood rotting and moisture penetrating your home. The earlier you tackle exterior painting issues the better: if you wait too long then you may face serious loss of value and high repair costs. Beside an Exterior painter MrFix can also arrange a qualified Handyman, Plumber, or Electrician. Need exterior painting in your region? Whatever your home improvement job is, MrFix has the best network of experienced, reliable painters in Amsterdam, Rotterdam, The Hague, Utrecht and elsewhere in the West and centre of Holland, up to and including Eindhoven. Fill in the form, then we will match you as quickly as possible to the right exterior painter, plasterer or paperhanger in your region.